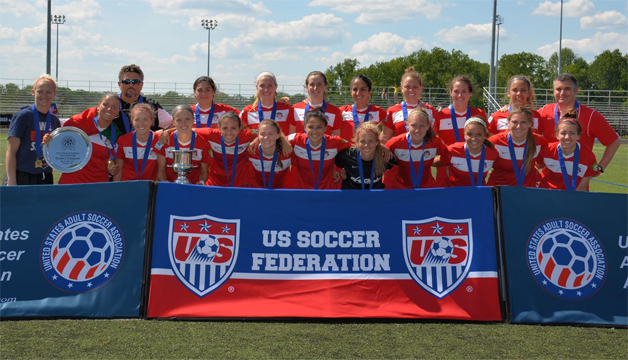 Following a fierce 120-minute battle worthy of a championship final, the Washington Spirit Reserves downed the Houston Aces 2-0 to capture the 2014 US Soccer National Amateur Championship Sunday afternoon in Baltimore, Maryland. Combining with a defense that refused to break over the course of the tournament, Washington relied on two late goals by Aaran Parry and Kelsie Pardue to collect the Michelle Akers trophy and accompanying national title crown. Completely opposite from Friday’s semifinal match, pitch conditions for Sunday’s final featured clear skies, warm temperatures, and only the occasional slight breeze. However the calmer climate did not lead to a calmer match, as both sides labored and fought throughout a back-and-forth match that did not determine a front runner until late in the afternoon. The first half saw each side gain and lose offensive ground, as the momentum seemed to switch every ten minutes between both sides. Although both squads created some dangerous opportunities, neither keeper was forced to deal with any difficult shots and the half ended scoreless. With a potential championship title closer within reach, both Washington and Houston increased their intensity in the second half. The Aces tested the Washington defense several times with speedy runs down both outside wings and came close to going ahead in the 65th minute after earning a corner kick. Houston drove the cross directly at the head of two crashing Aces’ forwards, but Spirit Reserves keeper Adelaide Gay stretched skyward off her line and managed to tip the cross away. As fatigue and the threat of overtime increasingly became factors, the Spirit Reserves looked to their bench for support. The strategy paid huge dividends as two substitutes combined to create the ultimate game-winner in the 72nd minute. Niomi Serrano raced forward from her right flank position to smack a switching cross deep into the opposite corner of the Houston defense to fellow substitute Ashley Cuba. Cuba eluded her mark and quickly rifled the ball back again across the Aces goal, catching the defense stepping the wrong direction. Washington forward Parry punished the misstep by burying the ball crisply into the net for the 1-0 lead. The real fireworks of the afternoon came only a few minutes later as Spirit Reserves midfielder Pardue intercepted a pass near midfield. The spritely Pardue raced forward, pulled the ball back to change direction, and danced through three defenders with the poise of a surgeon. After one quick glance, Pardue fired a laser shot from just inside 30 yards untouched into the upper left corner to seal the 2-0 victory. 2014 marks the first year a representative of the United Soccer Leagues (USL) W-League participated in the USASA National Amateur Championship. The Spirit Reserves represented the W-League while the Houston Aces had qualified previously as the 2013 US Open Cup champions. “But Kelsie’s goal was just stunning, a compete jaw-dropper,” concluded Schweitzer. The Spirit Reserves continue their W-League season next weekend on the road for a pair of away matches. On Saturday, May 31st, Washington faces the New Jersey Wildcats before following up the next day against the New York Magic. The Spirit Reserves return home June 7th for a rematch against the Wildcats. Match time is set for 7:00PM and will be held at Liberty High School in Bealeton, Virginia.